Claire Jeantheau (’21) argues that Quo Vadis is part well-intentioned message on religious devotion, part reflection of an era of global conflict, and part entirely empty spectacle. At Plautius’s house, Marcus and his soldiers catch sight of muscleman Ursus (Buddy Baer) while bathing. Marcus inquires whether he’s a gladiator, and Ursus responds that “It is a sin to kill,” much to the amusement of the soldiers. While walking in the garden, Marcus sees Lygia (Deborah Kerr) for the first time. He is instantly taken with her beauty and tries to attract her by quoting poetry at her, but she rebukes him. Marcus assumes that she is a slave, but learns from Plautius (Felix Aylmer) and his wife Pomponia (Nora Swinburne) at dinner that night that she is their adopted daughter. She was saved as a child from the Roman-conquered territory of Lygia, and Ursus acts as her protector. The meal is interrupted by the arrival of Paul of Tarsus (Abraham Sofaer), which Lygia’s family has been eagerly awaiting. He introduces himself to Marcus as first a rabbi, and then, seeing his confusion, as one who “teaches philosophy”. When Marcus leaves to check his men, Paul is safe to reveal his identity as a Christian, and bring the news that Peter, one of Jesus’s original disciples, will soon be coming to Rome. Marcus finds Lygia again in the garden, drawing the Christian icthys in the sand; he tries to appeal to her with talk of the upcoming triumph, but she is disgusted by his remarks. That night, she prays that he will come to Christ and set an example for others. On the day of the triumphal procession, Marcus leads the armies as conquering commander after rites conducted by the Vestal Virgins praising the Roman gods and Nero. The watching emperor is upset at the crowd’s constant demand for his entertainments, but Poppea (Patricia Laffan) reminds him that as an artist, he requires an audience. Afterwards, Marcus visits Petronius’s house, where he meets Eunice (Marina Berte), a Spanish slave woman he had been previously interested in. When Petronius sees that Marcus is no longer attracted to her, he learns of Lygia, and the two devise a plan to have Lygia abducted. Taken from her parents, Lygia is forced into “Nero’s house of women” and, with the help of manager Acte (Rosalie Crutchley), dresses for the night’s banquet. There, she sees Marcus and, understanding the purpose of her captivity, is angered. As part of the evening’s entertainment, Nero performs the composition about fire which he had been practicing earlier; he decides that it was inferior, as “one must suffer an experience to recreate it”, and from there is struck with the idea to burn Rome. Marcus orders Lygia to be taken to the house of Petronius. As Acte helps Lygia leave, she reveals that, while not Christian, she is a sympathizer, and wishes her luck. On the way to Petronius’s home, Ursus, who had been lying in wait, attacks the guards carrying Lygia, allowing her to escape. Marcus inquires Plautius where Lygia’s whereabouts might be, and through him finds a guide, Chilo (John Ruddock) to lead him to a secret gathering of the Christians. In their meeting cave, Peter (Finlay Currey) delivers a retelling of the life of Jesus. Marcus attempts to trail Lygia home, but is attacked by Ursus, who is unaware of his intentions; he is taken to Lygia, who treats his wounds and gives him a place to rest. Seizing his opportunity, Marcus asks to marry her, promising to adopt the Christian iconography and “put up a big cross, higher than the roof”, but she rejects this knowing that he has not truly accepted the faith himself. 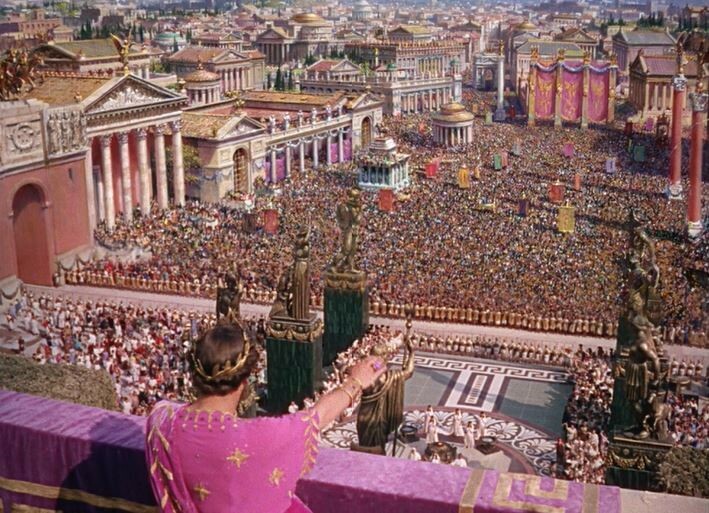 Shortly after, Nero announces that he has burned all the sections of Rome apart from his palace to form a new city, Neropolis, and to reach new artistic heights. Marcus, shocked, rides into the crowded areas of the city to find that they’ve gone up in flames, and helps citizens evacuate. As citizens riot outside of Nero’s palace, accusing him of being “the incendiary”, Poppea suggests he lay blame to the Christians so that the mob has a scapegoat. The Christians of Rome are rounded up and imprisoned, and Marcus finds Lygia there among them and joins her. As this occurs, Peter, who is traveling to Greece on the Appian Way, receives a heavenly sign in the forest to turn back to Rome after asking the film’s eponymous question “Quo vadis?”: “Wither thou goest, Lord?”. Petronius, suspicious that Nero is going to kill him, holds a dinner where, after freeing Eunice (whom he has fallen in love with), they both commit suicide. He also dictates a scathing note which expresses his true feelings about Nero and his works, devastating the emperor when he receives it. Nero arranges a spectacle in the Colosseum where the Christians are to be ripped apart by lions, and is disgusted by the way they sing and smile while condemned to death. When Peter returns, sensing trouble, he’s sentenced to be strung up on a pole over the sea. At night, dozens more Christians, including Plautius, are burned alive. Marcus and Lygia, realizing in full that they will most likely never see each other again, ask Peter to bless their partnership as a marriage so that they may be together in death. Poppea devises a final punishment—she has Lygia tied to a stake, Ursus by her side, facing down a charging bull. At the same time, Marcus is handcuffed to a pole in the emperor’s booth and forced to watch. Marcus prays for strength, and breaks free from his restraints as Ursus strangles the animal. When Nero signals (against popular vote) that Lygia and Ursus should still die, Marcus and his soldiers storm the center of the arena. He announces that Nero’s reign as emperor is over and that Galba, who is returning from a military campaign, is the next successor. As the crowd storms Nero’s palace that night, the emperor realizes that Poppea was the mastermind of the plot to blame the Christians and chokes her to death. Acte offers him the blade to commit suicide, which he does with her help. The end of the film finds Marcus and Lygia raising a family together as Galba triumphantly rises to power in Rome. The story of Marcus and Lygia’s romance, at the heart of Quo Vadis, is wholly fictional. However, the context it takes place in—the reign of the emperor Nero, from 37 to 68 AD—recalls a real historical period. Roman historians Tacitus and Suetonius address this reign in their works, focusing, respectively, on Nero’s place within Roman history and his personal character. Tacitus, who aimed to provide a detailed account of the emperors following Augustus in his Annals, provides the full historical background for events which linger at the periphery of Quo Vadis. The battles of Britain and Gaul which Marcus fights in most likely references, in part, the British revolt led by Boudicca, which occurs in Book XIV. A more frequently referenced event would be Nero’s arranged murders of his mother Agrippina and wife Octavia. These take place before the events of Quo Vadis, but are frequently mentioned by everyone from shouting spectators to Petronius in his suicide note as a kind of shorthand for Nero’s moral failings. According to Tacitus, Nero’s adulterous love for Poppea led him to depose of Octavia. When his mother Agrippina learned of his lust, her shame intensified their already contentious relationship (14.1). Tacitus is unfettered by the restraint of the already action-packed runtime of a film. He thus also has time to lay out the details of Agrippina’s death by beating after a failed drowning (8.1), as well as Octavia’s suffocation in a bathtub (64.1). In Quo Vadis, his crimes are instead committed out of the desire to “lay at the gates of an unknown world”—most likely to intensify his unhinged quality (and to tone down the severity of the acts for film). The most significant historical event under Nero’s reign directly referenced in Quo Vadis is the great fire at Rome, which the film accurately dates at 64 AD. Though the Nero of film plots this destruction, like his familial murders, as part of his artistic mania, the real fire’s initial source was uncertain. Tacitus acknowledges in writing his account that “whether [the fire began] due to chance or to the malice of the sovereign is uncertain—for each version has its sponsors” (15.38). Nero’s actions as recorded by Tacitus were much more helpful than those of his film portrayal. He allowed those displaced by the blaze to live in structures on the Campus Martius, his private gardens, and other open spaces (15.39). Rumors still spread that he was performing poetry as the fire raged, creating the apocryphal story of “fiddling while Rome burns” (15.39). Adding whatever aid Nero may have provided to Quo Vadis would have clearly undermined both his plot and his villainous status. Where Tacitus’s Annals are grounded in historical chronology, Suetonius’s Lives of the Twelve Caesars aims to form portraits of the personality and character of the first emperors. As a result, his record is known for being sensationalized; comparing it against the events of Tacitus or other historians is useful in determining what is real. From Suetonius, we learn the details of Nero’s obsession with the lyre, which Quo Vadis capitalizes on heavily to show his narcissism. Of Nero’s concerts, he writes that “It is said that some women gave birth to children there, while many who were worn out…secretly leaped from the wall…or feigned death” (Suetonius, Nero 23.2). But as a counterpart, Suetonius also takes time to list some of Nero’s beneficial actions, including devising a protection against forgery (17.1) and limiting expenditures (16.2). As with Nero’s historical aid after the fire, including these in Quo Vadis would lessen his portrayal of complete madness. An important point of comparison between film and historical sources is how each one handles the empire’s treatment of Christians under Nero. Both Tacitus and Suetonius take a negative, if not perplexed, view of the faith. Tacitus writes that the Christians were “loathed for their vices” and refers to their beliefs as a “pernicious superstition” (44.1); Suetonius uses near-identical wording when he writes of the “new and mysterious superstition” (16.2). There is no historical evidence that Poppea drove Nero to blame the Christians for the fire; in the film, this helps cement her as a sinister foil to the virtuous Lygia. Quo Vadis comes close to displaying the extent of the torture Christians faced after being assigned blame for the fire, complete with scenes of attacks by beasts and crucifixion. In real life, the details, though briefer, are even more grotesque: “When daylight failed [they] were burned to serve as lamps by night” (44.1), Tacitus writes. It is uncertain whether the Christians receive such a short mention because of a lack of concern from the historians, or if the worst of their persecution was short. However, that single, stark line from Tacitus conveys more about than the brutality of the torture than the adapted scenes of Quo Vadis. Quo Vadis was based on a 1895 novel by Polish author Henryk Sienkiewicz which had been adapted to film in Italy a number of times before director Mervyn Leroy’s 1951 project (Solomon 2001: 219). He was given a $12 million dollar budget with the hopes he would produce a quality ancient epic at a time when Metro-Goldyn-Mayer’s (MGM) production studios were on the verge of bankruptcy. He spent it fully, and the results are evident in the visual spectacles which are essential to Quo Vadis’s production. The film was shot on site in Rome, adding to the realism of natural scenes like the opening shot of Marcus and the 14th Legion crossing the Appian Way. There is an impressive menagerie of live animals throughout the film, from the cheetahs who lounge at Poppea’s side to the lions sent to attack the Christians in the arena. (Leroy had to secure fifty lions from circuses across Europe for use in the film, and it was a struggle to train them to charge at the actors who played the Christians [Solomon 2001: 219]). The extravagant tone is present not only in these showier scenes, though, but in smaller pieces of detail work. 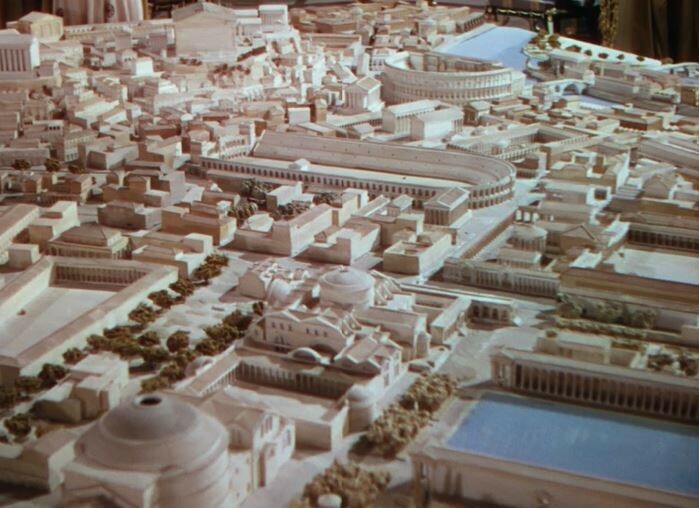 One camera shot focuses over an intricate model of Rome, which Nero uses for his redesign of the city. Quick aerial shots of the city of Rome, like those of the triumph, feature impressively painted backdrops with a variety of architecture that project an air of grandeur. Quo Vadis’s score has also been noted for how it conveys a similar, spectacular feeling. To achieve some degree of authenticity, composer Miklos Rozsa found surviving pieces of Greco-Roman music and adapted them into longer orchestration (Solomon 2001: 220). Nero’s sprawling replica of Rome (33:46). 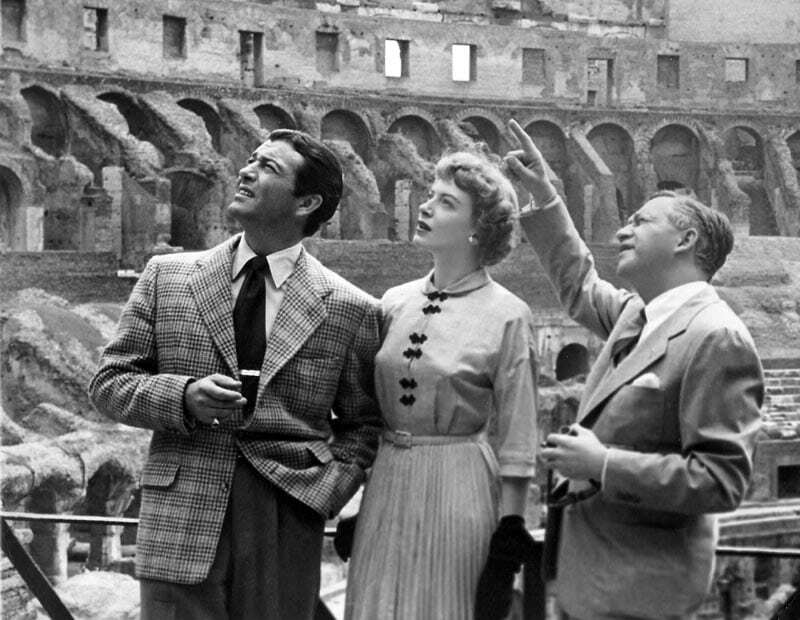 The use of spectacle in Quo Vadis was as much a point of focus for reviewers as it was for Leroy when he directed it. Critic Bosley Crowther, in his writeup for the New York Times, called it “the last of a cinematic species, the super super-colossal film” (Crowther 1951). The staff of Variety opined that “there are no ups and downs on the spectacular values that comprise the Circus of Nero, the profligate court scenes, the marching armies…” and so on, naming nearly a dozen scenes and set pieces (Variety 1951). Not all of these hold up for the modern viewer—in the scene where Marcus speeds towards the fire at Rome, pursued by Nero’s praetorian guard, the faint outline of the background video is noticeable. The overall appeal and cohesion of the visuals, though, is still well done. What remains consistent in reviews over the years is the film’s weaker characterization. Ben Pappas, revisiting Quo Vadis for Forbes magazine in advance of the release of Gladiator in 2000, snarked that by the end of the film, he had hoped the “superb pride of lions…[would] get their teeth into [Robert] Taylor”, a “wooden legionnaire” (Pappas 1951). This is a fair criticism—Taylor and Deborah Kerr’s performances as Marcus and Lygia, respectively, both pale in intensity to Peter Ustinov’s Nero, whose exaggerations and off-key prose fit well into the drama. Even Ustinov’s role could grow tiring, though, with Crowther complaining that the “notion that Nero was a monster and a numbskull is pounded at such length” (Pappas 1999). The moral absolutes of Quo Vadis’s plot hurt its characterization, creating roles more based on competing ideals than other traits. Quo Vadis was a commercial success which pulled MGM out of bankruptcy, and was nominated for eight Academy Awards. One of these nominations Best Supporting Actor, went to Peter Ustinov, who was prompted to say that “ ‘No nation can make Roman pictures as well as Americans’ ”. This quote sums up how “American”-style spectacle was a double-edged sword for Quo Vadis, leading to big and memorable visuals, but acting that could have been more nuanced. In the presence of the Romans’ oppressive power, martyrdom is elevated as a theme. Peter instructs the Christians that they must “obey those who govern you…even though, under them, you suffer cruelties”. Consequently, in the face of their punishment by the Romans, they find that ironically it is only through the act of dying that they can live out their faith. As Marcus ominously phrases it, “They know how to die”—the sacrifice becomes intertwined as an essential component of faith. The referential nature of how Quo Vadis’s script treats the course of history implies that there is a moral arc to such sacrifices. When Petronius attempts to dissuade Nero from assigning blame to the Christians, he argues that “You have often reminded us, Nero, of the judgment of history. What will its verdict be if you punish the innocent and betray your own greatness?”. Despite the brutal nature of the Christians’ deaths, it seems that they are avenged by history, a sentiment meant for the Christian viewer in particular to absorb. The calm humility of the Christians is contrasted with the irrational, pleasure-driven mob of Roman citizens. This is shown to moving effect in the scene where the camera cuts rapidly between horrifying footage of lions attacking the Christians and the delighted, jeering crowd. The nature of the settings which each group appears in helps to reinforce this binary. The one significant voluntary gathering of the Christians is their hidden service in the cave, which is structured around an orderly teaching of Jesus’s life. The story told by Peter is intercut with staged reenactments of significant moments, such as the Last Supper, which resemble Renaissance paintings. The figures who act as community leaders are portrayed as knowledgeable men. Paul’s identity is saved through his cover as a philosophy teacher, and Peter, bearded like a traditional wise man, speaks with a measured, thoughtful tone. The Roman populace, conversely, appears most often as a swarm, flocking to places of disorder like the arena and the streets of the triumph. Christianity and its associated values are not only shown as moral, but more rational than those promoted by the Romans. There is one interesting similarity between Quo Vadis’s diametrically opposed groups—both carry out their ideals on a global scale, though for entirely different purposes. The Christians want to reach others through good works—“to conquer…with love”, as Paul phrases it. The Romans, in turn, are baffled by this concept. “Conquest…is the only method of uniting and civilizing the world…have to spill a little blood to do it,” proclaims Marcus, the epitome of warlike ideal before his transformation. The global scope mirrors the context of the film’s release, in the years of World War II’s end and the Cold War’s beginning. An American viewer might be more inclined to sympathize with the approach of “love”—in political terms, the cooperation promised by alliances or groups like the United Nations—as opposed to another bellicose power. The Romans find themselves aligned with not only the oppressive powers of the previous war, but, by virtue of their avowed anti-Christianity, the new power of the secular Soviet Union. When Marcus accepts Christianity at the film’s end, he muses about “A more permanent world…or a more permanent faith. One is not possible without the other”. It’s a clear call for a mode of governance influenced by a set of values that would have resonated with viewers at the time. Quo Vadis straddles the line between sword-and-sandal film and Bible epic—though it takes place during an era of Roman history, it inflates the religious concerns of that period and pairs them with Biblical story. It succeeds when it matches the conventions of each genre, tying together spectacular visuals and religious story. But its attempts to strike a balance between the two lead to an erratic last act, as events follow one after the other in an increasingly operatic mood. In the span of approximately thirty minutes, dozens of Christians become martyrs for the faith; Nero murders his wife before committing suicide himself; the emperor is deposed in riots and replaced by Galba—and yet Marcus and Lygia are still able to escape and prosper. The rapid occurrence of each of these moments reduces them to scenes of quick action rather than depth, especially when they involve hammy acting (Peter Ustinov’s wails during Nero’s suicide, for example). Yet perhaps this is in keeping with Quo Vadis’s many dualities—the Christians against the Romans; love against war; the troubled relationship of Nero and Poppea in contrast with the eventual marriage of Marcus and Lygia. Is it a well-intentioned message on religious devotion, a reflection of an era of global conflict, or entirely empty spectacle? Regardless of what conclusion the viewer comes to, its imagining of Rome is big enough to include them all as possibilities. Crowther, Bosley. “’Quo Vadis’, Based on Sienkiewicz Novel and Made in Rome, Opens at Two Theaters.” Review of Quo Vadis. The New York Times, 9 Nov. 1951. “Imperial Rome: Christian Conflicts.” The Epic Film, by Derek Elley, London: Routledge, 1984, pp. 124-126. Joshel, Sandra R., et. al. “Oppositions, Anxieties, and Ambiguities in the Toga Movie.” Chap 1 in Imperial Projections: Ancient Rome in Modern Popular Culture, Johns Hopkins University Press, 2006, pp. 23-49. Joshel, Sandra R. et. al. “The Roman Empire in American Cinema after 1945.” Chap 2 in Imperial Projections: Ancient Rome in Modern Popular Culture, Johns Hopkins University Press, 2006, pp. 50-76. Meyer, Stephen C. “Spectacle and Authenticity in Miklos Rozsa’s Quo Vadis Score.” in Epic Sound: Music in Postwar Hollywood Biblical Films, Indiana University Press, 2015. Pappas, Ben. “Hail, Caesar!” Review of Quo Vadis. Forbes, vol. 163, no. 8, 19 Apr. 1999. Quo Vadis. Directed by Mervyn Leroy. Metro-Goldwyn-Mayer, 1951. “Quo Vadis.” Imdb.com, https://www.imdb.com/title/tt0043949/ (accessed May 10th, 2018). “Quo Vadis (1951).” Big Screen Rome, by Monica Silveira Cyrino, Blackwell, 2000. Solomon, Jon. “Erato: The New Testament and Tales of the Christ.” Chap 5 in The Ancient World in the Cinema. Yale University Press, 2001, pp. 216-222. Suetonius. The Lives of the Caesars. http://penelope.uchicago.edu/Thayer/E/Roman/Texts/Suetonius/12Caesars/home.html (accessed May 5th, 2018). Tacitus. Annals. http://penelope.uchicago.edu/Thayer/E/Roman/Texts/Tacitus/home.html (accessed May 5th, 2018). Variety Staff. “Quo Vadis.” Review of Quo Vadis. Variety Movie Reviews, Dec. 1951.